Ross Hauser, MD . The regeneration of articular cartilage with prolotherapy. Journal of Prolotherapy. 2009;1(1):39-44. Note: Since this article first appeared in the Journal of Prolotherapy in 2009, new research has continued to support the use of Prolotherapy for articular cartilage repair. Hyperlinks have been added to the original text to take you to that research. Simply put, I believe that articular cartilage is regenerated with Prolotherapy. In my opinion, Prolotherapy should be the treatment of choice for most cases of pain involving the degeneration of a joint. It is common knowledge that even the most effective current treatments for osteoarthritis do not restore the joint. Conservative treatments such as exercise, medications, physical therapy, and lifestyle modification can decrease symptoms and improve mobility, but they do not reverse the disease. I believe if Prolotherapy were utilized to its fullest in the treatment of knee, shoulder, and other peripheral joint degenerative conditions, it would be shown to be the one treatment that does restore some, or most, of the degenerated structures, as well as the functions of the joint. What most people may not realize is that chondrocytes, the cells that make articular cartilage, are metabolically active. (1) Yes, chondrocytes do proliferate and actively make articular cartilage. In normal cartilage, there is a strict regulation of cartilage turnover, a delicate balance between synthesis and degradation. The problem is, for those suffering from osteoarthritis, the system is imbalanced. There is more cartilage degeneration than rebuilding. In osteoarthritis, both degradation and synthesis of articular cartilage are enhanced. The problem is that the “messenger” molecules that allow cells to communicate and alter one another’s functions, called cytokines, cause more breakdown of articular cartilage than repair. The catabolic (break down) cytokines IL-1, TNF-a, IL-17, and IL-18 act to decrease extracellular matrix synthesis (cartilage synthesis). The anabolic cytokines (substances that build up) IGF-1, TGF-B1, 2, and 3, fibroblast growth factors (FGFs) 2, 4, and 8, and the bone morphogenetic proteins act to stimulate extracellular matrix synthesis. (2,3) In osteoarthritis, unfortunately, the catabolic cytokines are winning. When larger osteophytes are examined from human patients, areas of hyaline cartilage can be seen to extend to the surface of the osteophyte. These cartilaginous tissues resemble genuine articular cartilage in chondrocyte morphology and in extracellular matrix. Interestingly, the anabolic factors TGF-B and TGF-B2 have been found in osteophytes from human femoral heads.18 Again this signifies that adult articular cartilage retains repair (anabolic) activity. Table: Physiology of osteoarthritis. While articular cartilage is stimulated in osteoarthritis, the net result is degeneration in part because of the increase in catabolic cytokines. One of Prolotherapy’s effects on the physiology of osteoarthritis is thought to be an enhancement of anabolic cytokines which stimulate cartilage regeneration. What happens to articular cartilage when it is subjected to mechanical trauma? It is important to consider the main issue. Can adult articular cartilage respond to appropriate stimuli by an increase in its synthetic activities for DNA and matrix components? In other words, can chondrocytes replicate and make cartilage? Central to this discussion is the consideration of the ability of any tissue to increase its rate of DNA and protein synthesis. Regardless of the tissue involved, the process of repair is a cellular one in the sense that fibroblasts, or specific cells (osteoblasts, chondrocytes for example), must synthesize the repair material. For the most part, these are “new” cells that evolve by cell replication and modulation of existing cells, or from cells that have migrated either from the margins of the wound or from blood vessels entering the tissue. It is therefore important to recognize that DNA replication and cell division are essential characteristics of any repair process. Cartilage repair can be stimulated by a number of means: pressure changes, trauma, varied oxygen, tension, pH alterations, calcium, growth hormone factors, vitamins, nutrients. The confusion in regard to articular cartilage repair stems from the fact that chondrocytes from immature cartilage are capable of dramatic repair and synthesis, whereas aging chondrocytes show much lower rates of cell replication.26-27 This is where the notion of “cartilage cells don’t replicate” stems from. The problem with this logic is that a normal adult chondrocyte is phenotypically different from an injured chondrocyte. Analysis of cartilage from joints with osteoarthritis has demonstrated, over and over again, an increased number of cells in clones and evidence for DNA synthesis by a number of means including 3H-thymidine metabolic studies, autoradiography, and even histological demonstration of mitotic figures.28-30 These data suggest that under circumstances of chronic injury, such as is seen in osteoarthritis or trauma, chondrocytes are capable of mounting a significant reparative response and can replicate their DNA to form new cells.31 This is fact. Chondrocytes can divide, and do so in the adult animal/human with osteoarthritis and from other stimuli. Ample evidence now exists that articular chondrocytes from immature and adult animals can vary the rate at which they make cartilage matrix necessary for repair. This rate of proteoglycan synthesis can change in response to such diverse physical and pathological states as osteoarthritis (as discussed), altered hydrostatic pressure, varied oxygen tension, alternations in pH, calcium concentration, substrate concentration, and the presence of growth hormone (as discussed), growth factors, ascorbate, vitamin E, and so on.32-26 I could easily elaborate on each of these, but the reader is encouraged to check the references for further information. Therefore, it is reasonable to conclude from the above that injured adult articular cartilage chondrocytes have the capacity to substantially increase their rate of matrix synthesis, and that the possibility exists of chondrocyte participation in the repair of articular cartilage. All that is really needed is a method to stimulate that repair maximally. This is where Prolotherapy fits in. George S. Hackett, MD coined the term Prolotherapy. As he describes it, “To the treatment of proliferating new cells, I have applied the name Prolotherapy from the word prolix (Latin), meaning offspring; proliferate-to produce new cells in rapid succession. My definition of Prolotherapy as applied medically in the treatment of skeletal disability is ‘the rehabilitation of an incompetent structure by the generation of new cellular tissue.’”37 While traditionally used for ligament and tendon repair, Prolotherapy has a long history of being used for degenerative joint disease.38-41 Like the chronic knee pain study published in February 2009 issue of the Journal of Prolotherapy,42 Prolotherapy has remarkable pain-relieving effects. But when a person with degenerative knee arthritis reports less stiffness and crunching in the knee, as well as improved motion, are we to assume that there has been cartilage repair? I would answer the question with an emphatic “yes” in most cases. But some would remain skeptical. This is why the February 2009 issue of the Journal of Prolotherapy also presented five before and after X-rays of knees showing cartilage regeneration.43 Does this prove that all Prolotherapy treatments on degenerated knees stimulate cartilage regeneration? Absolutely not! But it surely shows that Prolotherapy treatments to human knees do have the potential to regenerate articular cartilage. For those who have had numerous treatments and have seen the function, signs, and symptoms of their degenerated joints reverse with Prolotherapy, is it reasonable to assume that the articular cartilage is being stimulated to repair? How else would you explain a decline in stiffness, clicking, and crunching in the person’s knee treated with Prolotherapy? How do you explain the inability to walk or do any athletics, but yet with a number of Prolotherapy injections into and around the knee, the person regains his walking ability and is now able to perform athletics? How about improvement with Prolotherapy in those patients who have been told they need knee replacements, or those whose doctors say there is no other treatment available for them? What about in these cases? If the person receives Prolotherapy to their end-stage osteoarthritic joint and not only do they not need a knee replacement, they are back to dancing, how do you explain it? Placebo? I think not. Something has changed. Their joint architecture has changed. There has been some rebuilding inside their joints. In essence, they have a regenerated joint. The chondrocytes have been activated to start making cartilage and that cartilage has been laid down. I believe in changed lives. I believe a changed life is enough. In other words, if a person cannot walk much because of a degenerated knee and has been told by an orthopedist that he needs a knee replacement, but he refuses and decides instead to get Prolotherapy, and if after Prolotherapy treatments he can walk well with virtually no symptoms, I am satisfied. 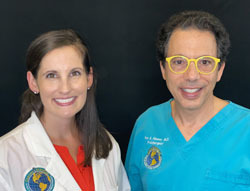 Their life was changed with Prolotherapy. 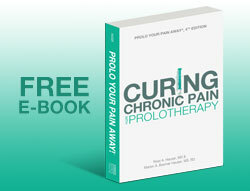 I believe the patients when they tell me that it was the Prolotherapy that turned their lives around. I believe that the Prolotherapy regenerated the injured tissues. I believe that the person can now have a full life. That full life is because of Prolotherapy. Prolotherapy worked for them. I do not need an MRI or X-rays or a biopsy of cartilage cells to know that Prolotherapy worked! The bottom line is you can’t have it both ways. If the orthopedist is saying to a patient that your knee pain, grinding, crunching, pain upon bending your knee, and your inability to walk without a limp is from your cartilage degeneration and you need a knee replacement, then the opposite must also be true. If that same patient, after receiving Prolotherapy to the knee, has no more, or very little, pain, grinding, etc., can walk unlimited and does hiking and climbing, then it must mean that their degenerated cartilage has been regenerated! 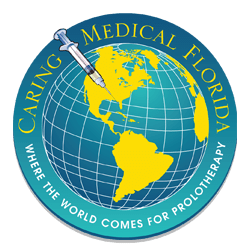 To put it bluntly, Prolotherapy regenerated their cartilage! This is my main point! I know there are a lot of skeptics out there. They want “evidence” that Prolotherapy works. They need to see before and after X-rays and MRIs. Well, that is part of the purpose of the Journal of Prolotherapy. 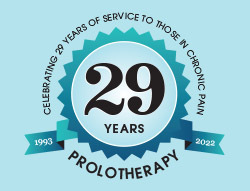 The goal is to educate the world on the life-changing effects of Prolotherapy. Some of the people in the world who need educating are the traditional doctors who treat pain patients. They need to know of the life-changing effects of Prolotherapy on degenerated joints. One of the effects of Prolotherapy is to change a degenerated joint without much cartilage to a joint that has more cartilage. How will that appear to the physician examining the joint? The doctor would notice a smooth-gliding joint instead of a joint that makes grinding, clicking, and popping sounds while the physician puts the joint through its range of motion. It is definitely noticeable and demonstrable. To the patient, the joint after Prolotherapy will produce much less crunching or clicking sounds when the knee or joint is moved, as well as when going up and down stairs. As a given, he will experience less pain and stiffness. Here are some suggestions to those with degenerated joints that were regenerated with Prolotherapy, and for those who use Prolotherapy in their practices. Let’s start obtaining before and after Prolotherapy X-rays, and if possible even MRIs. Make sure the X-rays and MRIs taken after Prolotherapy are compared to the ones taken before Prolotherapy, and are evaluated by an independent radiologist who understands that the patient had Prolotherapy. I believe that you will most likely see structures be regenerated! The average radiologist has never seen menisci or cartilage tissue regeneration. Tell him you performed (or received if you are the patient) Prolotherapy on the joint. Ask him specifically if he sees regeneration of articular cartilage, menisci, ligaments and any other structures? Do not be surprised when the radiologist says, “yes.” Send us the films to be published in the Journal of Prolotherapy. Perhaps then we can eliminate some of the skepticism about Prolotherapy and people can receive the treatments they really need, such as Prolotherapy. At least one of the myths that prevails in the world of orthopedics, that articular cartilage does not regenerate, will be dismissed once and for all. We can then rejoice because people with pain will get the treatments they need. Perhaps people everywhere will finally understand that cartilage can be stimulated to repair, and that it is Prolotherapy that is needed to regenerate articular cartilage. Hering TM. Molecular biology of cartilage repair. In Osteoarthritic Disorders Edited by Kuettner K, et al, Rosemont, Illinois: American Association of Orthopaedic Surgeons, 1995;pp.329-340. Hauser R, et al. Prolo Your Pain Away! Third Edition. Beulah Land Press, 2007;p.32. Hackett G. Joint stabilization. American Journal of Surgery. 1955; 89:968-973. Reeves K. Prolotherapy: present and future applications in soft tissue pain and disability. Physical Medicine and Rehabilitation Clinics of North America. 1995;6:917-925. IBID. Randomized prospective double-blind placebo-controlled study of dextrose Prolotherapy for knee osteoarthritis with or without ACL laxity. Alt Ther Health Med. 2000;6(2):37-46. IBID. Randomized, prospective, placebo-controlled double-blind study of dextrose Prolotherapy for osteoarthritic thumb and finger (DIP, PIP, and trapeziometacarpal) joints: evidence of clinical efficacy. J Altern Complement Med. 2000;6(4):pp.311-320. Hauser R, et al. Standard clinical X-ray studies document cartilage regeneration in five knees after Prolotherapy. Journal of Prolotherapy. 2009;1:22-28.